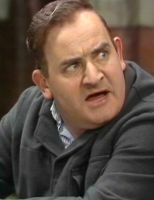 “Ronnie” Barker, (25 September 1929—3 October 2005) was an English actor, comedian, writer, critic, broadcaster and businessman. He was known for his roles in various British comedy television series, such as The Frost Report, Porridge, The Two Ronnies and Open All Hours. The Four Candles sketch written by Ronnie (under his pseudonym of Gerald Wiley) has been acknowledged as one of the funniest ever. R.B. lived in Pinner, Middx., and when his daughter Charlotte wanted to join YT North Harrow, he came along to see what the group was like. He sat through a session of mime and improvisation, and obviously liked what he saw, as not only did Charlotte join YT, but Ronnie agreed to become a Patron, and was a quiet but steady supporter. Often, he would arrive to pick Charlotte up a bit before the end of the meeting, and would sit quietly at the back of the hall - writing. He went to all the YT Harrow shows, but always slipped into a seat at the back and left as the curtain fell. He was a shy man and didn't want all the fuss that there would be if he was recognised - but he also didn't want to take the focus away from the young members of YT. He decided to retire in 1987. After his retirement, he opened an antiques shop with his wife, Joy. After 1999, he appeared in a number of smaller, non-comic roles in films. 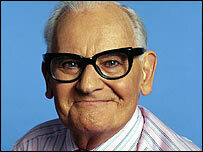 Barker died of heart failure on 3 October 2005, aged 76.